The UA-1030T Premier Talking Blood Pressure Monitor improves upon all of the innovations A&D Medical has created over its 30+ year history. This fully featured monitor is equipped with innovations in cuff design, inflation and deflation (Triple A Technology). To speed up readings users can preset pressure levels or set them to automatic. The UA-1030T offers the option of TriCheck measurement which allows users to take three consecutive readings and receive an average, complying with the American Heart Association’s latest recommendation. The UA-1030T has the option to give all readings and instructions in English, French or Spanish. People resist taking their blood pressure because it can be uncomfortable. As a cuff constricts during a measurement, wrinkles form on the inside of the cuff. The material bunches up against a user’s arm and creates discomfort. The new SmoothFit Cuff is designed to seamlessly conform to the user’s arm and give the most comfortable experience possible. 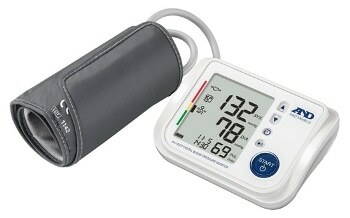 It comes standard with the UA-1030T Premier Talking Blood Pressure Monitor. TriCheck – Three consecutive measurements and advanced averaging. Pressure Rating Indicator – Providing a snapshot of the user’s blood pressure classification according to the US JNC7 and WHO guidelines. Irregular Heartbeat Detection – Alerts the user to the presence of an irregular heartbeat while still providing an accurate reading. Advanced Warning System – Alerts the user to the most common problems while monitoring, and helps to avoid them. Triple A Technology – Advanced cuff design, advanced inflation and advanced deflation, which translates to faster more accurate and more comfortable readings. SmoothFit Cuff – Seamless conforming cuff to take the pain out of monitoring.